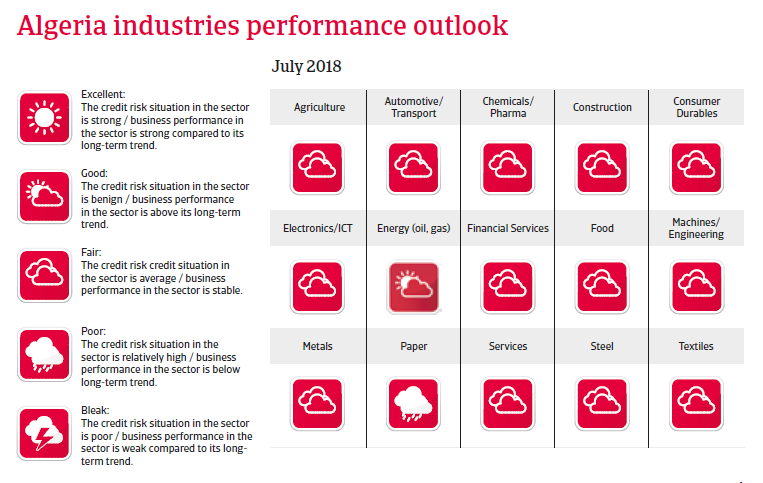 Despite the rebound in oil prices economic growth is expected to recover only modestly in 2018 as fiscal consolidation hampers private consumption growth. In Algeria, political power rests mainly with President Bouteflika, who is now 81 years old and not in particularly good health. There is no obvious successor at hand, and it cannot be ruled out that tensions within the political elite could increase if Bouteflika unexpectedly steps down before his term ends in 2019. The National Assembly still has limited powers, despite some constitutional amendments to improve transparency and to strengthen democratic elements. The internal security situation remains stable for the time being, but major shortcomings (endemic cronyism, high unemployment, lack of affordable housing and rising living costs) and limited success of the government to diversify the economy have increased the risk of social unrest, especially among younger people. At the same time, the risk of terrorist attacks remains elevated due to on-going political turmoil in neighbouring Libya and Mali. Algeria’s economy is underpinned by the oil and gas sector, which accounts for more than 95% of export revenues, and 60% of government budget. The government has tried to limit the economic impact of the 2015/2016 deterioration in oil prices by using fiscal savings accumulated in the country’s oil stabilisation fund during the oil price boom to prop-up public spending. 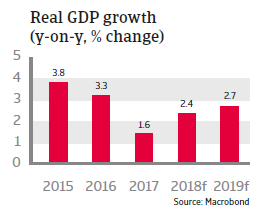 Despite the rebound in oil prices GDP growth is expected to recover only modestly in 2018 as the oil fund is nearly depleted and the effects of fiscal consolidation still hamper higher private consumption growth. 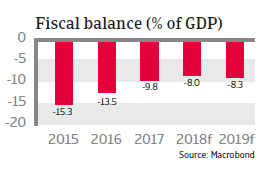 Algeria’s budget deficit will remain high in 2018 and 2019 due to higher capital and social spending, while subsidy cuts will be more limited than previously expected. Tackling the vast welfare system remains sensitive, given the potential for social unrest. Moreover, it is possible to finance the deficit by central bank borrowing the incentive for fiscal reform remains relatively low. The Algerian dinar has been under renewed pressure. 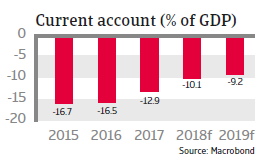 The current account deficit is expected to remain high in 2018 and 2019 (at about 10% of GDP) despite a decreasing trend since 2017. So far, the annual deficits have been financed by drawing from foreign reserves, but also by a modest increase in borrowing. Running a deficit seems to be manageable in the short-term as both government debt and foreign debt are still low (20% of GDP and 4% of GDP respectively). 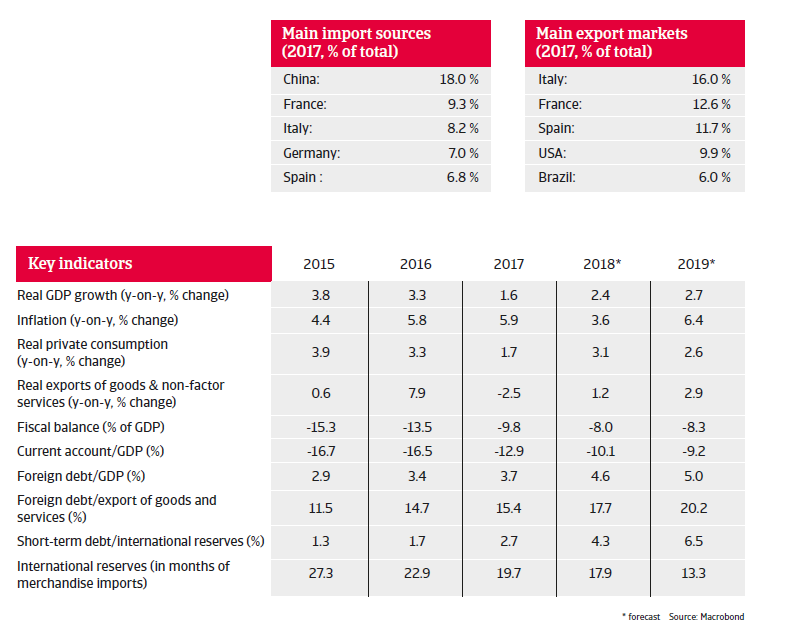 While foreign reserves remain at a comfortable level they continue to rapidly decrease, from 30 months of import cover in 2014 to 18 months in 2018 and 13 months in 2019. In order to protect the reserves the government has further tightened already existing import restrictions. In order to ensure prosperity and stability in the long-term, the authorities would have to accelerate their current rate of economic diversification. However, government intervention (it is estimated that 90% of Algeria’s GDP is still controlled by the state), red tape, corruption, limited access to finance and a rigid labour market still hamper private enterprise initiatives and foreign investment, slowing down the necessary economic transition. The burden on fiscal policy and domestic financing pressures could be alleviated if the government chooses to start borrowing on the international market. All eyes are on US trade policy, but we forecast trade to continue to grow robustly in 2018.